The Silvermine West section of the Table Mountain National Park has been reopened. Closed since fires destroyed large areas of the Peninsula in March last year, this section of the park has been rebuilt. Following the March fires, most of the Silvermine and Tokai section have been closed off to visitors for all activities in order for the sections ranger team to get to work on rehabilitation projects. This included footpath work, rebuilding of damaged structures, closure of illegal paths, law enforcement and monitoring of the affected areas. Table Mountain National Park reopened Silvermine East in September while work at Silvermine West continued. Work in this section included the rebuilding of all the boardwalks and walkways around the Silvermine Dam, down the popular River Walk as well as the viewing deck at Blackburn Ravine. If you have any free time on the morning of 28th September Chris Van Zyl from the Vineyard Hotel in Claremont, will be heading a team of volunteers for Alien Clearing at Silvermine. A group of children from the Amy Biehl Foundation will also be helping out. 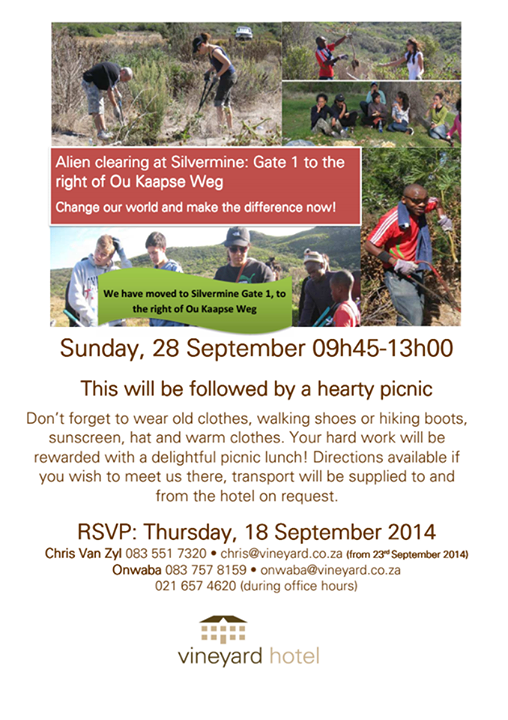 Volunteers can meet at Gate 1 at Silvermine or travel with the team from the Vineyard Hotel.